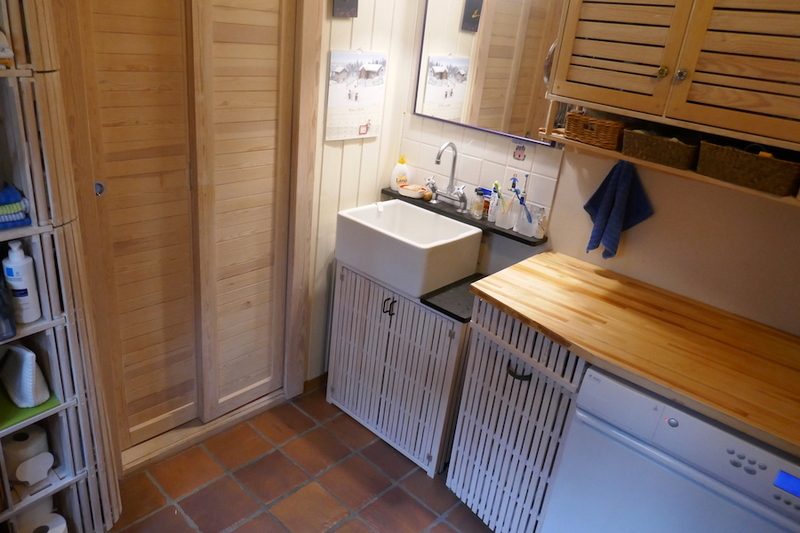 This page is in group Hobby and is a follow up 13 years after; when we now also replaced a curtain and an old, tired (but nice) laundry box with some new stuff made from basically only 6 * 21 mm and 8 * 21 mm pine wooden strips. Our laundry room wasn’t quite finished in 2006. 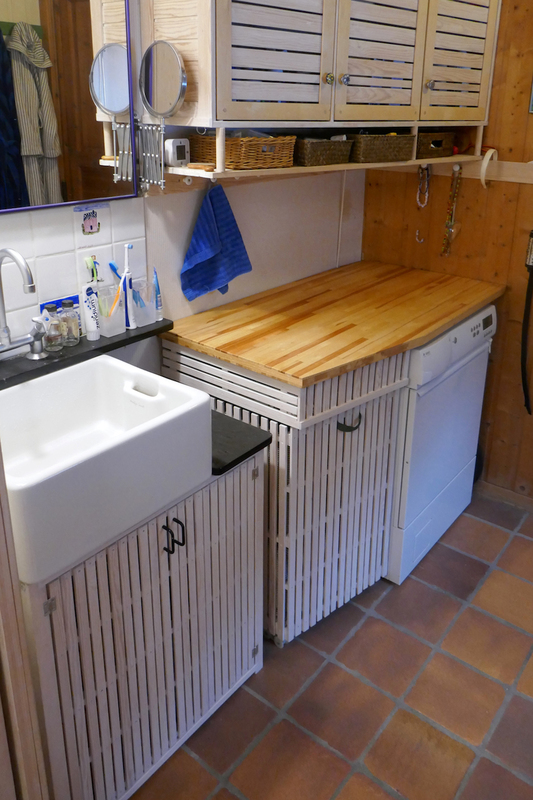 There was still the old laundry box made about a hundred years ago as a woodchip weave basket. My grandparents used it, my parents have used it. Now it’s ready for my children or grandchildren since it is still nice, used for the right purpose and given appropriate care first. Then we had a cloth curtain only in front of the wash buckets and wastebasket. I guess the pictures would speak somewhat for themselves. We have a washing machine but use a Dutch airer for drying. But my wife wanted a workbench. So I found the old cross-laminated workbench that we retired from the kitchen some 20 years ago, when the lacquer and scratches didn’t seem promising. After having been painted by a daughter I now went to a local carpentry workshop and had them sand it “to dimension”. It became as new! (By the way, the Trysling kitchen was designed by Svein Ivar Dysthe in 1972 and we installed a softer looking version in 1980. It was produced by Trybo-Tryslinghus AS (standard disclaimer) and had a low price tag.) It’s basically only painted and installed with modern appliances, but is still very functional and nice to use. And who would design such a workbench today? You can see the plywood-like details on the chamfered part of the top. I did not want to frame it with a list, because it was so nice to look at. Then we treated the workbench with beeswax. Enough about what I didn’t make but am so respectful of. 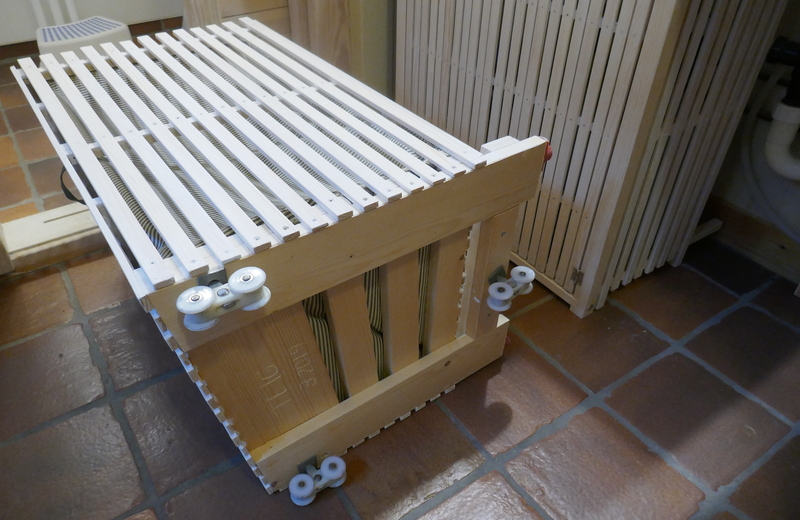 The main thing is the laundry box that runs on three sliding doors roller wheels, used upside down. Each of the three bogies has four wheels and two axles and one threaded metal screw that are positioned in a rather heavy bottom frame. Two of the wheels in the front and one in the back make up for a wobble-free experience. Also, with this single metal screw for each of the three wheel sets it’s easy to level the box along any axis. I think the wheels are nylon or PVC so the sound would have been softer with rubber wheels. But I had these. The box is pulled out with a soft handle. It’s filled inside with a cotton sack that my wife Mari sowed. Then there is the drawer. 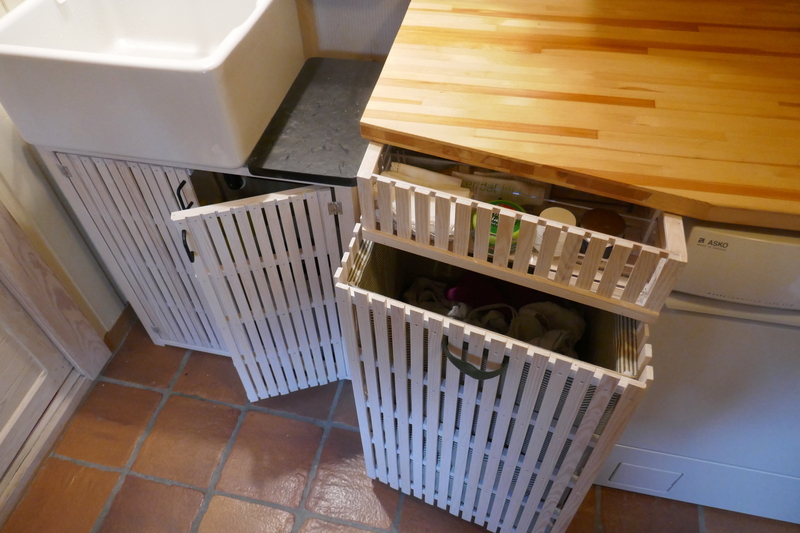 I made the drawer runners from two aluminum strips that I also had. Aluminum screwed on the underside of the workbench, inside the drawer, and just the wooden 8 mm strips on top of the drawer. It runs quite well, not as nice as steel ball-bearing slides, but it’s less technical. Nice for a programmer like me! The drawer is pulled out by placing the fingers underneath it. I screwed and glued every crossing point. 2.5 mm by 12 and 16 mm screws, since some wooden strips are 8 mm and some are 6 mm thin, to make up for less monotonous fronts. It’s important to bore first, if not the wooden strips that would get all the screws along its body would break up. I have used 15 mm veneer and made strips from them for the most parts. The door frame and its 90 degrees side are mounted with two bolts and two nuts that I just fastened with my hands. The basin and the stone slab are fasted separately, so the door frame basically rests on the floor. Which is enough, after I made some stopping points and holding points not seen. With a wooden strip on the floor and an eyebolt on the top. All is painted with white oil paint that we wipe away after five minutes, so that the structure of the wood is seen. Pine darkens fast, so this must be done before the sun has taken charge. To be two persons for this job, is nice. In Norwegian: Baderomsmøbler lagd av furulister på 21 * 6 og 21 * 8 mm montert litt tilfeldig for at frontene ikke skulle bli så monotone. Bordplata ble pensjonert fra et ikke-engang-nå pensjonert kjøkken, for 20 år siden. Kjøkkenet, Trysling var designet av Svein Ivar Dysthe i 1972 og vi har hatt vårt (en litt lettere utgave) siden 1980. Det fungerer fremdeles veldig bra, men vi har malt det og uppgradert det som trengs. Det var produsert av Trybo-Tryslinghus AS. (Standard disclaimer.) Benkeplata er krysslaminert! Slå den! Trykk på bildene så får du mer detalj. Jeg fikk den dimensjonsslipt på et snekkerversksted, og den ble som ny. Lakk, hull og maling – borte vekk! Skittentøykurven kjører på tre boggihjul fra skyvedører, montert opp-ned på en kraftig treramme. To hjulsett foran og ett bak, så vingler den ikke – og derfor blir kurven også veldig lett å vatre opp. Om du må kjøpe, prøv å finne noen med gummihjul. De går stillere enn mine, som jeg bare hadde, som er i nylon eller PVC. Skuffen henger i glidere som jeg lagde i aluminium og monterte under plata på innsiden av skuffen. I dem glir skuffens topplist av 8 mm furu. Tyngre å dra enn tilsvarende skuffeskinner i metall, men mye mindre teknisk. Greit for en programmerer! Malt med hvit oljemaling som tørkes bort etter fem minutter, slik at man får en laseringseffekt. Furu blir fort mørkt, så dette bør gjøres før sola har fått tatt alt for mye tak. Obs: de andre møblene i dette rommet er dekket i tre notat fra 2006, se lenkelista øverst i dette notatet.